Our range of products include carbon steel fasteners and alloy steel flanges. We are renowned organization in the market, highly involved in offering a broad collection of Carbon Steel Fasteners which is widely used in various industries. 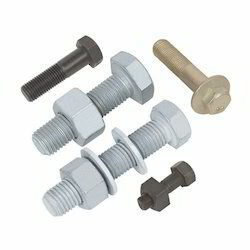 Our offered fasteners are widely known for its smooth finish and anti corrosive nature. Our provided products fabricated at our well installed manufacturing unit using top notch grade components and high tech tools & machinery. By keeping track of present market development, we are providing a commendable array of Alloy Steel Flanges. Our offered flanges are acknowledged for their cost-effectiveness, sturdiness and remarkable quality. These flanges find wide applications in chemical, processing plants and many other industries. The offered array of flanges is fabricated using quality approved metal and contemporary machines as per the industry defined norms. Looking for Carbon Steel Fasteners ?